Click below to read reviews from all of our happy customers. No need to worry about your new HVAC system. No need to worry about the cold weather! We provide only the best installation, repair, and replacement of furnaces and other heating systems. Make sure you always have a cool home when you need it with Buchner Heating, AC, & Plumbing's expert air conditioning installation, repair, and maintenance. Your indoor air is important to the health of you and your loved ones. Call us today to ensure your home is as efficient as it can be! Never worry about plumbing emergencies again with Buchner Heating, AC, & Plumbing's expert staff of plumbing technicians. Give us a call to get started! Thanks for checking out our website! We would like to offer you a $20 discount when you call and schedule a service visit with Buchner. Just Call & Mention Coupon To Claim! Welcome to Buchner Heating, Air & Plumbing: The Name You Can Trust! We hold your satisfaction above all else and hope to hear from you soon. If you have any questions, we can help! Just call (630) 896-4600. Buchner Heating, AC, & Plumbing is your one-stop shop for a wide range of essential services in the Chicagoland Area. 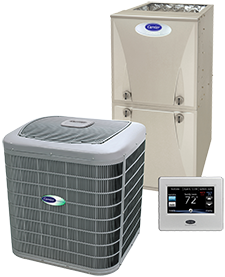 We offer effective solutions to plumbing, heating, cooling, duct cleaning, and indoor air quality needs, facilitating your everyday life with superior products and job performance. Serving the Fox Valley Area since 1919, we’ve perfected our services to ensure greater cost and time-savings, making it simple to get the help you need. Contact us at (630) 896-4600, speak with a knowledgeable member of our staff, and we’ll immediately focus on meeting your requirements. For new installation, retrofit projects, proactive maintenance, skilled repair, and more, Buchner Heating, AC, & Plumbing provides prompt response, quick turnaround, and lasting solutions. Buchner Heating, AC, & Plumbing … The Name You Trust. Buchner Heating, AC, & Plumbing is available to assist you 24/7, with Emergency Repairs across the Chicagoland Area. We employ a dedicated team of professionals who are well versed in all makes and models of plumbing, HVAC and air quality products. Utilizing leading-edge technology, and adhering to proven procedures, we optimize performance of equipment. Call today for reliable HVAC & plumbing repairs, installations, and maintenance! Whether we are custom designing a plumbing, heating, cooling or air quality system for your household, handling upkeep, or resolving a problem, we take the extra steps to maximize the reliability, efficiency, safety, and value of your investment.